Description: The North Negros Forest Reserve (NNFR) is one of the critical resources of Negros Occidental, as its remaining old-growth rainforest is said to be the last intact watershed in the province. 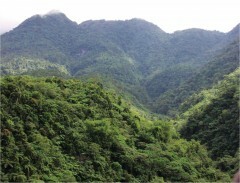 Unabated resource exploitation, especially logging and extraction for charcoal production as well as rattan, ferns, and orchids trade, have posed as primary threats to the local biodiversity. Tinagong-dagat Lake is located inside North Negros Natural Park (NNNP). The NNNP supports the Malogo, Imbang, Himuga-an, and Bago Rivers, and is a source of water for 17 municipalities and cities. It’s a part of a wider array of watersheds which include the Bacolod watershed, Sipalay-Hinobaan, and Mt. Canlaon. The NNNP's remaining old-growth rainforest is said to be the last intact watershed in the province. Decades ago, an entire forest reserve, encompassing an area of 80,454 hectares was a lush tropical forest. Today, only 20% of it remains. The NNNP stakeholders are resource users (e.g. farmers, forest product gatherers) and resource managers of forest resources who are members of POs that are affiliated with MUAD and the various government offices and agencies involved in forest rehabilitation and protection. These include PEMO, CENRO, PENRO, Task Force Ilahas, Negros Forests and Ecological Foundation, Inc. (NFEFI), Genesis Foundation, and the Mutual-sectoral Alliance for Development-Negros (MUAD). The whole forest reserve has the following land classification: Integrated Social Forestry (ISF) and Community-Based Forest Management (CBFM) Project, contract reforestation project, regular reforestation project, resettlement, watershed, remaining Forest Reserve, and waterways. Out of the 80, 454.5 ha of NNNP, a total of 40,643.38 ha are occupied by farmers and 11,265.8 ha of these are ISF areas. There are 30 ISF associations within NNNP which is composed of 3,705 holders of Certificate of Stewardship Contract. The PEMO, CENRO, and PENRO hold the legal authority to draw, finalize, and enforce environmental policies and programs. However, the role of MUAD and other NGOs in forest governance also equally significant because they assist in IEC, capacity-building, and resource mobilization. At the community level, local POs, like the Bantay Bukid Brigade (BBB) and the Task Force Ilahas, are crucial partners in implementing forest protection. Increased logging since 1960, when infrastructure developments improved access to the forest resources; Food industry is also a key driver of heavy logging practices. Hunting of bird species for game. An estimated 840 birds per week were killed within a 600-hectare hunting ground in the late 1990s/early 2000s. Multi-Sectoral Alliance for Development, Inc. and Third District Alliance Of Resource Managers, Inc.
Biogeographic assessment and socio-economic profiling in the site conducted to provide baseline data for subsequent conservation initiatives. , with the support of provincial and municipal LGUs and the DENR. Training and deputization of local community members to serve the important Bantay Gubat Information, education, and advocacy for natural resource conservation. Development of livestock-based enterprises to provide alternative livelihood resources that will lessen the pressure on forest products. Foundation for the Philippine Environment. 2013. Distilling Oil for Nature: Trade-offs in Community-based Watershed Conservation (KALIKASAN BCSD Knowledge Series Fourteen). Quezon City, Philippines: Foundation for the Philippine Environment. Foundation for the Philippine Environment. 2013. Pagsugod sa Pagbulig para sa Lasang: Encouraging Participation of People’s Organizations in Forest Resources Management (KALIKASAN BCSD Knowledge Series Eight). Quezon City, Philippines: Foundation for the Philippine Environment.